Join with others in the Bay Area to support a national day of youth-led marches demanding action on climate now. 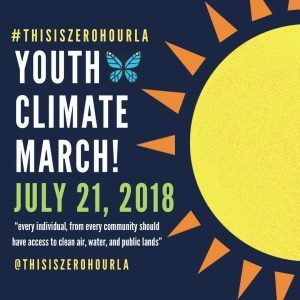 Initiated by one of the Seattle teenagers suing the state of Washington for failing to protect them from climate change, this national youth network will hold a lobby day followed by a march in Washington DC, with sister marches in many cities across the country. Seattle teenager Jamie Margolin started planning the upcoming climate march, which she calls Zero Hour, last August, after the Trump administration announced its plans to withdraw from the Paris climate agreement. She recruited Mrinalini Chakraborty, head of strategy for the national Women’s March, to help the students file for permits and plan logistics. Now, the organizing committee includes dozens of youth from Connecticut to California. The official website for the march launched last week. More info about the Zero Hour youth movement here and here.